After many months of construction, renovations have been completed at several CTA stations along the Blue Line. 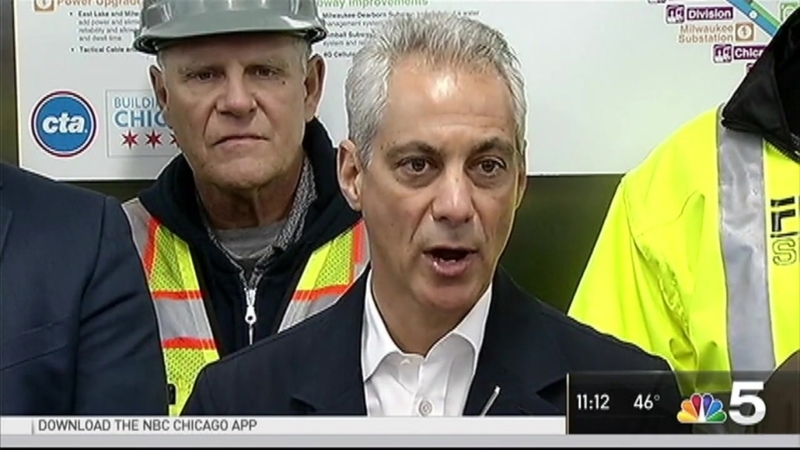 Mayor Rahm Emanuel joined CTA President Dorval R. Carter Monday morning to announce that crews have finished work at five O’Hare brand CTA stations. “Today is an important milestone in our efforts to modernize transit infrastructure in Chicago, and we will continue making these much needed investments across the City to ensure we are providing the safest, most reliable service for commuters,” Emanuel said in a statement before the appearance. "There are now new tracks, signals and power between the Loop and the northwest side – all of which will make the ride smooth, safe and speedy." Stations that have been completed under the $492 million “Your New Blue” modernization project include Addison, Irving Park, Montrose, Harlem and Cumberland stops. The “Your New Blue” project is the largest investment made to the Blue Line since it was extended to O’Hare more than 30 years ago. Addison: New elevator; extended stationhouse and new enclosed stairway; improvements to the platform and platform canopies for better weather protection; refurbished platform furniture (i.e. benches, windbreakers, trash bins, etc. ), new lighting; and painting of station and platform. Irving Park and Montrose: Improvements to platform and platform canopies; renovated platform furniture; replaced walkway railings; new lighting and repainted stationhouses and platforms. Harlem: Improvements to platform, platform canopies floors and walkways; repairs to stationhouse curtain walls; rehabilitation of platform furniture; and new lighting and painting. Cumberland: Improvements to platform, platform canopies and walkways; replacement of stationhouse curtain walls and other improvements, including new lighting and painting at the stationhouses, platforms, and walkways; and upgrades to stationhouse and platforms, which includes new lighting and painting. Monday’s announcement comes on the heels of more big news for “L” commuters. On Sunday, it was announced that the Chicago Transit Authority approved $75 million in funding to extend the Red Line. The Red Line currently only runs to 95th Street, but plans are now in the works to build an extension that will add more than five miles to the line, bringing riders all the way to 130th Street. Four new stations on the city’s Far South Side will be built along the way. The engineering phase on the Red Line begins next year, city officials said. No estimate on when the extension is expected to be completed has been announced.